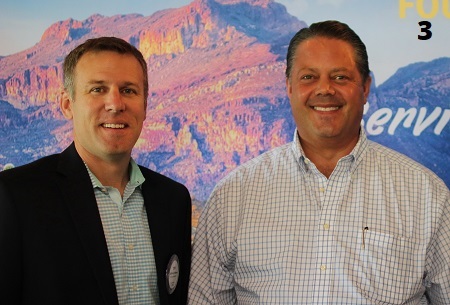 Rotarian, Tony Siebers, introduced Jason Bagley, Director Government Affairs at Intel Corporation, to Rotary Club of Scottsdale members and guests at the Club's luncheon held at McCormick Golf Club's Pavilion. Bagley, a public affairs professional, currently manages government affairs for Intel Corporation's U.S. Southwest Region. This region includes approximately 85 percent of Intel's leading-edge manufacturing capacity, as well as, significant research and development. He leads Intel's public policy strategy and engagement with government officials at the local, state and federal level for this region. Intel established its presence in Arizona in 1979. There are approximately 9,700 employees, making it the 2nd largest Intel site and the largest employer in Chandler, Arizona. Since 1996, Intel has invested over $12 billion in high tech manufacturing capability in Arizona and spends over $450 million each year in research and development. Intel contributes more than $2.6 billion in economic impact to Arizona including more than 20,000 additional jobs as a result of Intel's operations here. The topics Mr. Bagley addressed during his program included: the microchip industry; Intel's operating philosophy regarding manufacturing plant construction; exciting new and magical technologies, including application of "Moore's Law" for micro-processor process improvements; and Intel’s footprint in the Valley (employees, size of campus, secondary jobs created, tax revenue generated, Intel's employee community involvement and more). Bagley answered questions, including one related to Intel's successful collaboration with ASU's Materials Management and Logistics programs. The Rotary Club welcomed home Ashley Norman, 2016 graduate of Scottsdale's Desert Mountain High School. Ashley spent the year in Taiwan as the Club's sponsored Rotary International Youth Exchange (RYE) student. RYE was an opportunity of a lifetime for Ashley. She joined more than 8,000 students who participated in the program this past year. By sharing her own culture and embracing a new one, Ashley helped to foster global understanding, learned a great deal about herself and the country of Taiwan in the process. For more information about Rotary Club of Scottsdale - see www.scottsdalerotary.org. 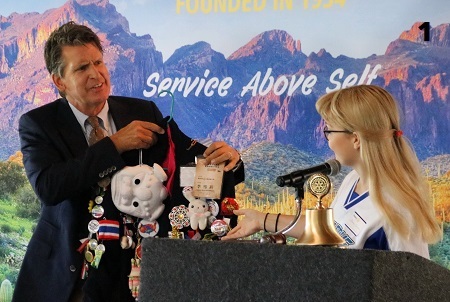 Club President, Charlie Kester, noted that the Club's 2016-16 Rotary International Youth Exchange student, Ashley Norman, kept up the Rotary tradition to adorn her blazer with pins and patches as evidence of her RYE experiences. 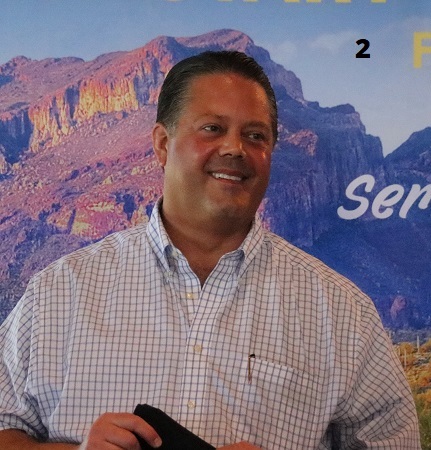 Jason Bagley, Director Government Affairs at Intel Corporation, speaking at August 7, 2017 Rotary Club of Scottsdale luncheon meeting. Rotarian Tony Siebers introduces Jason Bagley, of Intel Corporation, to Rotarians and guests.